For many years the only regional festival in Victoria was at Nariel Creek, near Corryong, which has been running since the late 1950’s and still attracts an enthusiastic crowd. It was felt by many people, that due mainly to distance, something more central was needed. The first National Folk Festival was originally to have been held in Kilmore in 1967 but because of the unexpected number of people showing interest it was decided to hold it in Melbourne. After a couple of years there it rotated around the capital cities and Alice Springs (but not Darwin or Hobart) for a number of years until it found its permanent home in Canberra in the 1990s. In early 1974, at the Nariel Creek Folk Festival in N.E.Victoria, Ian Huxley and central Victorian friends (including Peter Cuffley) discussed the need for a folk festival in Central Victoria and decided Maldon was an ideal spot. Ian Huxley was then a resident of Maldon and he and Peter McDonald (of ‘Mulga Bill’s Bicycle Band’ fame) mustered interest among performers and audience, mainly by word of mouth and a little advertising and the Maldon Folk Festival was born. The first two festivals were held at the Bill Woodfull Oval (football oval). Really, these were little more than social gatherings for musicians and listeners and attracted something between 150-200 people. It is interesting to note that Port Fairy attracted just over 180 in its first year. First Maldon Folk Festival, 1974, Football Oval, Maldon. Photo: Russell Boyd. At the first Festival, in September 1974, a makeshift stage was created with hay bales on the back of a truck at the football oval. Dances were called by James Buchanan and Peter McDonald. Ian Huxley’s ‘scratch band’ consisted of himself on banjo, Peter McDonald on guitar and Chris Wendt (formerly ‘Wild Colonial Boys’) on accordion. 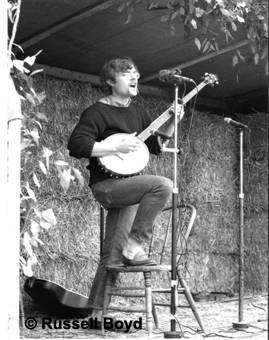 Stan Gottschalk; first performer 1974 Maldon Folk Festival. Photo: Russell Boyd. Huxley was also in ‘The Last Gasp Bluegrass Band’. The ‘Loose Scratch String Band’, which included Kevin Ziebell, Jack Harvey and Ian Noyce (guitar maker), had come from Ballarat. Rowan Webb, Rob Lewis, Russell Boyd, Geoffrey Boyd, Ian Sullivan (Mulga Bill’s), Peter Schultz, Pieter Groenveld and Peter Monger also performed. Richard ‘Skreitch’ (‘Chalky’) Leitch also recited his bush yarns. The first couple of festivals consisted of sessions at the Kangaroo Hotel, sessions around the camp-fire at the Oval and a concert at the Oval on the Sunday afternoon. Camping was at the Oval. Because the ‘74 and ‘75 festivals clashed with the ‘Maldon In Spring Festival’, it was decided, with a couple of changes in the organising group, to move the festival to the last weekend in October and the venue to the Butts Reserve at the foot of Mount Tarrangower. The next 11 years (1976-1986) saw almost all of the activity held at the Butts Reserve, at the foot of Mt Tarrangower. This proved to be an ideal venue with its natural amphitheatre and plenty of room for camping. 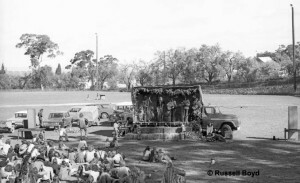 Maldon Folk Festival, Butts Reserve 1977. Photo: Peter Cuffley collection. During this period the festival kicked off with an informal session at one or more of the pubs on Friday evening. Concerts were held at the Butts on the Saturday and Sunday afternoons, with a bush dance on the Saturday night. Usually a session would start up at one or other of the pubs on the Saturday evening after the concert involving those who didn’t feel like dancing. The concert was run as a sort of chalkboard arrangement in those days. Anyone wishing to perform would give their names to the organisers and wait to be called. Over the years the number of performers built up to the extent that soloists were restricted to two items and bands to four. The concert would last most of the day. The festival was almost entirely free at that time. Audiences did not pay and performers did not get paid although there was an entry fee for the Saturday night dance. This was to pay for the hire of the hall. The dances were usually held at the Baringhup Hall, although a couple were held in Castlemaine. Funds were raised by means of a blanket collection on the Saturday and Sunday afternoons to pay for hire of equipment, PA etc. In 1986 the organising group had decided to call it a day and announcements were made to that effect during the course of the 1986 festival. Their decision would have meant the end of the Maldon Folk Festival but for the actions of one well known character rallying a couple of his mates and stepping into the breach. Before moving on it is fitting to mention some key people. In the first two years Ian Huxley and Peter McDonald were prominent with a couple of helpers. When the venue and weekend were switched in 1976 Ian stayed on as part of the new group which was led by Helen McGeachin and Roddy Read (‘the Chewton mob’). Ian, Helen and Roddy were members of the Chewton band, ‘Tipplers All’ from whom were drawn most of the organising body with a few relatives and friends. Roddy will be remembered especially as the MC at the Saturday and Sunday concerts for many years. The Roddy Read Memorial Songwriting Award is named in his memory. The man who took the reins after 1986 was one Neville ‘Fatty’ Wilson. Neville was well known to festival goers long before then however. He could be seen taking the blanket around for donations, seeing that campsites were well supplied with firewood and a host of other jobs with always a word of welcome for people. The story goes that Fatty said to someone, ‘I know very little about folk music but I’m a damn good organiser’. The reply was, ‘Well I’m hopeless at organising but I know a bit about folk music’, and the festival was up and well and truly running. When Neville Wilson and a couple of mates picked up the running of the festival they each dipped into their pockets to put in $50 to pay for insurance to enable the festival to continue. The years from 1987 to the present time have seen some significant changes, the first of these being the introduction of an entry fee and weekend passes. Many will remember the koala tokens. The entry fee has facilitated the booking and utilisation of higher profile performers, while retaining a very good line-up of amateurs and local people. From 1987 the weekend was shifted to that leading up to the Melbourne Cup holiday. The bush dance from 1987 – 1989 was held in the Main Street on the Saturday night and has been held on the Friday night. Since then it has been held on the Friday night in the Community Centre. In a short time a Folk Festival committee was established and on festival weekends a ticket office was set up. This was for many years under the verandah of the Kangaroo Hotel. In this period, although the main stage and concert area remains at the Butts Reserve, many other venues have been used in the town. These include pubs, cafes, gardens and churches. The Primary School provides the site for a very popular craft market and Children’s Circus. A link with the Football Club, on the site of the original Festival, is maintained with musical items and the Poet’s Brunch held in the club rooms. The year 1996 saw the introduction of a concert at the Golf Club featuring local and visiting artists. The Guinness Tent was a popular venue at the Butts, as is the Troubadour Wine Bar, which became a feature in 1997. All performers are accommodated and catered for and a wide range of food and refreshment is available for visitors to the festival. In 1995 the Maldon Folk Festival was honoured to receive the Australia Day Event of the Year Award from the Maldon Shire Council for the 1994 Festival. They received it again in 2013 for the 2012 festival. Neville Wilson unfortunately passed away in 1996 but during his time as president he built up and moulded a very good working committee which as committees go, is large but everyone has an allotted task. Unlike the early years and with only two or three exceptions, the committee are all residents of Maldon. In 1997 we were able to lease the vacant Tourist Information Centre as a Festival Office. This is shared with other community groups, most notably, the Maldon Easter Fair. Apart from ticket sales we have received some sponsorship from all levels of Government. The festival enjoys some corporate sponsorship and is also generously supported by many of Maldon’s traders. Compiled by Brian W Cuffley, July 2016. This is an ongoing project, as old performers are interviewed and historical detail is gathered. Sources: Helen McGeachin, Graham Dodsworth, Richard Leitch & Peter Cuffley. The early history written up by Graham Dodsworth (partly based on interviews with Ian Huxley) on his website has been particularly useful. In April 2016 a video by members of Turtle Video / Footscray Community Video of the 1974 festival was sent to us by Heino Saarelaht. Earlier in the year some great photos of the 1974 Festival were sent by Russell Boyd. We are very grateful to both Heino Saarelaht and Russell Boyd. Stan Gottschalk, Russell & Geoff Boyd, Margaret & Michael Crichton are thanked for their identification of performers in the video and photos.